Since 1982, Torquato Drilling Accessories has been delivering high-quality, American-made drilling bits, reamers and accessories to customers worldwide. We work with drilling contractors, energy producers, oil field service companies and pipeline contractors to provide them with some of the best products in the oil and gas industry. 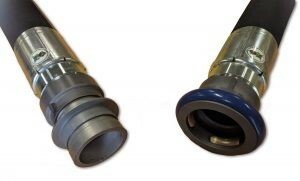 Our latest offering, Quik-Connect Frac Water Supply Hose Fittings, enhance well site efficiency and eliminates the need for outdated hammer unions. Quik-Connect is the only quick connect/disconnect hose fitting for frac water supply hoses on the market! These hose fittings are great when attaching to water tankers, frac tanks, hose-to-hose and a full range of other applications. Quik-Connect frac water supply hose fittings connect in just a matter of seconds. Once they’re connected, they stay together with a strong, three-point spring loaded POSI-LOCK system that is field-rated to withstand pressures of more than 500 PSI! Want to disconnect? It’s a snap. With a simple push on the lock release ring, the hoses separate easily with no tools required! Made from a special lightweight super-alloy, these frac water hose fittings are designed to last. Not only are they strong, but a built-in seal makes them leak-proof, too. Quik-Connect’s innovative system saves you time and money and even helps prevent injury. Our Quik-Connnect frac water supply hose fittings connect and disconnect in just5 seconds, saving you valuable time on the job site. Plus, by eliminating the use of hammer union connections, our fracking hose connectors reduce injuries among your employees. 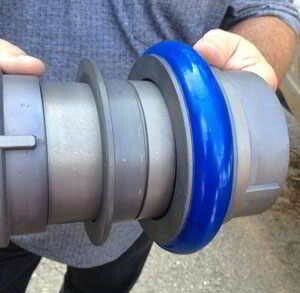 To learn more about our Quik-Connect frac water supply hose fittings, send us an email at bits@torquato.com. We’d be happy to share more information with you, including pricing information. Contact us to find out why the top contractors and companies in the oil and gas business are using Quik-Connect for their hose fitting and connection needs!